for “Good Morning America” in 2005.
spend a day in jail. The Gravelles faced a maximum of 15 years in prison, but despite their former children’s pleas for justice, they were given lenient sentences of six months to two years. Shortly afterwards, Attachment Therapist Elaine Thompson, pled guilty to related misdemeanor charges of failure to report the treatment as abuse and is awaiting sentencing. One child tried to control his laughter during the first courtroom statement by his adoptive mother when she tried to blame her choices on a welfare system indifferent to the behavioral problems she supposedly had with her children. Despite the parents’ claims that they were overwhelmed by their eleven “special needs” children, the Gravelles were in the process of adopting a twelfth, an infant in foster care placed by an Illinois agency. By this time, neither Michael nor Sharen was working outside their home; they were collecting up to $99,000 a year in adoption subsidies and state aid, not counting medical and treatment expenses billed directly to the government, and they were demanding still more. The Gravelles had turned their rural home near Wakeman, Ohio, 60 miles southwest of Cleveland, into a de facto orphanage for minority children. 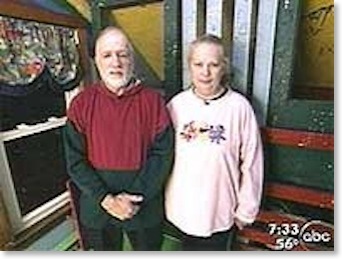 Over the space of less than a decade, the couple — with no professional training or special qualifications (and despite the fact that the couple had first met in sexual-abuse counseling where Michael had been ordered for molesting his biological daughter in the 1980’s) — managed to convince government and private agencies from four Ohio counties and one in Illinois to place a dozen children in foster care with them. When they formally adopted their foster children, state oversight apparently stopped. Nonetheless, when a man being asked to provide respite for the Gravelle family reported child abuse to Job and Family Services, no action was taken. County and state social services did not conduct any significant review of conditions in the Gravelle home until reports reached the Huron County Sheriff’s office in mid-summer, 2005. Investigators then discovered that the Gravelles had for some time been requiring most of the children to sleep in wood-and-chicken-wire cages wired with alarms to sound if the doors were opened at night. In September, deputies and social workers raided the home and removed the children. The children were put into foster care, along with the infant from Illinois. And the “caged children” then became a sensational, national story. and another forced to live in the bathroom for 81 days, sleeping in a bathtub, because of a bed-wetting problem. Many of these particular abuses have often been seen in cases involving Attachment Therapy (AT) and AT Parenting (ATP). Sent by an agency to interview for provide respite care for the Gravelles, one man testified that Michael Gravelle regarded himself as a “Moses” to his children, and that Sharen Gravelle referred to her 11 black children as “monkeys.” He also witnessed a boy sent to bed in mid-afternoon for the night for asking permission to use the bathroom when it wasn’t his “scheduled time.” Disturbed by what he saw there, the man declined to take the respite position. Another person the Gravelles say they discovered on the Internet was Elaine Thompson, a licensed social worker working as an Attachment Therapist out of nearby Elyria, Ohio. (Thompson and her business partner Mershona Parshall — who has been prominently connected to Attachment Therapy for a decade or more — also offer the unvalidated adjunct Neurofeedback, reportedly used by Thompson with the Gravelle children.) Sharen Gravelle settled on Thompson after her first choice, Attachment Therapist Gregory Keck of Cleveland, was not immediately available; Thompson had a “similar” practice, she determined. Sharen later testified that her treatment of the children was just following Thompson’s advice and instructions “to the letter.” However true that claim may be, it is certainly true that Thompson was intwined with the Gravelle family. She did “holding therapy” (i.e., Attachment Therapy) on some of the children for years. From 2002-2004, Thompson billed Huron County for over $100,000 in treatments for Gravelle children. By the summer of 2005, Thompson reportedly had reduced her client base to just the Gravelles. Thompson’s role with the Gravelle family also earned her a grand-jury indictment for 32 criminal charges, half of them felonies, most of them for aiding or abetting child abuse and for failing to report child abuse. Of course, the child abuse she was charged with abetting and not reporting are things the Gravelles claim she instructed or encouraged them to do. Thompson plea-bargained the charges down to three failure-to-report misdemeanors and faces a maximum of nine months in jail, plus up to $750 in fines. There is good news about the children unfortunately caught up in this nightmare. All are reportedly doing well now, none displaying the intransigent, atrocious behavior reported by the Gravelles. “They're going to have a chance, you know, to have a normal life now and grow up in a safe family environment, which is not what they’ve had over the last couple of years in the Gravelle home,” said Douglas Clifford, an attorney for the children, after the Gravelle’s parental rights were terminated.